In our family’s my never-ending quest to save money, water, energy, and the environment, I’ve tried lots of ways to save more by using less. Here are some ideas that will help you save too! 1. Cook with your toaster oven, electric skillet and slow cooker whenever possible. Small appliances use less energy. 2. The oven retains heat (and food keeps cooking) after the oven is turned off. Save energy by turning the oven off 5 minutes before your food is done cooking. Put lids on pans to retain heat and save energy too. 3. Use half as much dishwasher detergent as you normally use (this is my favorite brand). 4. Use rags or old tee shirts instead of paper towels. 5. 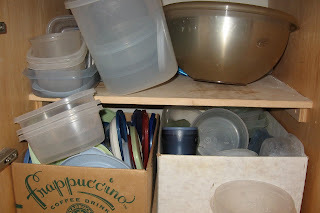 You don’t need a zillion pots and pans in the kitchen, or lots of plastic containers either. Cut down to a few all-purpose pieces to save cupboard space and piles of dirty dishes. 6. Only fill the sink halfway with water when doing dishes. 7. Rinse and reuse ziploc bags (except those that have held raw meat). Every time we run out of homemade waffles, I make another batch and refill the bag. 8. Keep the rubber bands from broccoli, asparagus, etc to use around the house. This is especially handy if you don’t get the newspaper anymore. 9. Turn your hot water heater down to 125. Anything hotter will scald you (or the kids). Besides, soap is more important for getting rid of germs than warm water. 10. 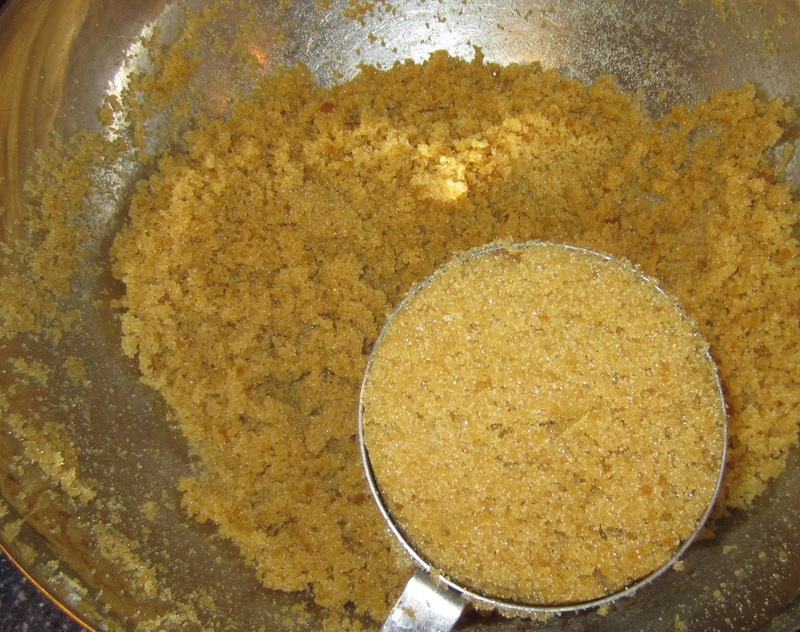 Powdered milk is much cheaper than regular, but we just can’t get used to the taste. It works great in recipes though–so keep a box on hand to reduce your cooking costs! 11. Mix cooked lentils in with your taco meat to stretch it (one of the many things I learned from The Everything Beans Book). 12. Use less sugar when making cookies. The recipe on the chocolate chip cookie bag calls for 3/4 cup EACH of brown sugar and white sugar–I just use 3/4 cup of homemade brown sugar and they taste great. 13. Get your sweets/chocolate fix by eating a few M&Ms instead of a whole candy bar. 14. Don’t add unnecessary ingredients just because “they’re always included.” For example, fried rice doesn’t need an egg to make it authentic or filling. 15. Real maple syrup and olive oil are expensive! Keep yourself from over-pouring by transferring them from the original bottles to a durable squeeze bottle. 16. Use a pea-sized bit of toothpaste. The big globs you see on commercials make you overuse so you run out faster and buy more! 17. Put shampoo and body wash in a pump bottle to prevent spills or over-glugging. 18. Crimp the toilet paper roll so it doesn’t spin freely. This keeps you from grabbing too much and keeps the kids from unrolling it just for fun (ask me how I know). 19. Put a rubber band around the shaft of the soap pump to slow it down. This keeps the kids from pumping a zillion gallons of soap into their hands (again, ask me how I know). 20. Don’t wash your hair every day, and only put conditioner on the ends of your hair. 21. Fill the bathtub halfway or less for the kids. Splashes will be less devastating and you’ll save on water. 22. When you open a container of mouthwash/shampoo/toothpaste/etc, write the date on the container. When it runs out, challenge yourself to make it last 10% longer next time. 23. Try cloth toilet paper. Really! 24. Trim your bangs yourself (or guys, trim around your ears) instead of paying your stylist to do it. 25. Ask your stylist which drugstore products you could use to get the same look. 26. Air dry your hair instead of blow-drying, curling, flat-ironing, etc. 27. Don’t take a multi-symptom cold medicine if you only need to treat one symptom. 28. Use a Diva Cup instead of disposable monthly products. 29. Replace your department-store beauty products with drugstore versions whenever possible. An eyeliner pencil that costs $20 at Clinique is $4 from Cover Girl! 30. 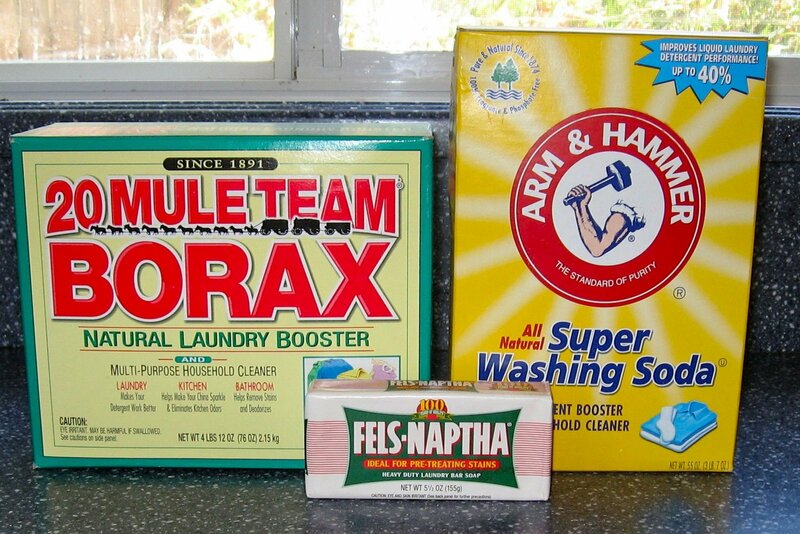 Make your own laundry detergent with just three ingredients. 31. Quit using dryer sheets, or cut them into halves or fourths. Use each sheet twice. 32. Spot-clean laundry instead of washing it fully. 33. Hang clothes to dry (especially jeans, to retain their color and save on dryer time). 34. Don’t rely on the dryer’s automatic settings. Set the dial for a certain amount of time, check and adjust accordingly. 35. Make your own laundry freshener instead of buying chemical products. 36. Grab the scoop or whatever measuring device comes with your detergent. Fill it up to the recommended amount and then dump that into a measuring cup. Use half that much and see if it gets your clothes clean. 37. Check and empty your dryer’s lint filter with each load. If air can’t flow freely, clothes will take longer to dry–using more energy. 38. Ask your energy provider if energy costs more during peak times (typically business hours). If so, do laundry/run the dishwasher/watch TV at off-peak times for extra savings. 39. Walk or ride your bike for short errands to save on gas. 40. Turn your thermostat down in the winter and up in the summer. 41. Use lower-watt lights in hallways or anywhere bright light isn’t essential. 42. Use only as many lightbulbs as you need. We have a 4-light fixture in the bathroom, and one of the bulbs burned out. There’s still plenty of light to do everything without replacing that bulb. 43. Make gift bags instead of buying gift bags, tissue, ribbons, and wrapping paper. 44. Try your local college for free entertainment. We’ve gone to free movies, concerts, and more! 45. Have you noticed that as diaper sizes go up, the number of diapers in the box goes down? Use a smaller size for as long as possible. 46. Teach your kids to save and help them make healthy choices when eating out. If they choose water over soda at the restaurant, pay them $1. That’s less than the soda would cost you, and helps them get a good habit going. 47. When you change the fishtank water, use the “old” water for the garden. Veggies and flowers love fishy-poo water. 49. Use envelopes, junk mail, etc as scratch paper. 50. Use big cans of tomatoes/beans/etc instead of buying hand weights. 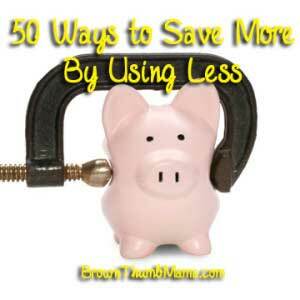 How do YOU save more by using less? Share with us in the comments! This article was shared on Money Saving Mom, Party Wave Wednesday, Wildcrafting Wednesday, The Thrifty Home, Your Green Resource, Simple Lives Thursday, Thank Your Body Thursday, and Fabulously Frugal Thursday. Lots of great options! Here are a few more. Not overeating has many benefits. Buy fewer books and use the library (saves space as well as money). Own fewer clothes (unless you need more to be able to run a full load of laundry). Don’t use dryer sheets at all. My mother gave us 6 kids dried milk powder. We won’t drink it or throw it out when she wasn’t looking. Then she started doing 1/2 milk and 1/2 powder. Worlds of differences. We had no problem drinking it. She may have gotten it to 1/4 whole milk and 3/4 powder. I am not sure. I found a dish soap recipe that I tweak just a little. Not only does it work great but it has BUBBLES. I love bubbles. I posted it on on the #103 or# 104 ( one of those two ) farm girl blog hop if you would like the recipe. I am now following you. Thanks for the tips. Lots of great ideas….even if you don’t want to or don’t feel comfortable using them all. Love all the ideas! I found using a pump for shampoo helped my kids use less. Thanks for sharing these tips at Fabulously Frugal Thursday. Thank you for this list! And so glad you linked up at H2W this week! I want to try #38 and love #40! Such a great list of tips! I especially love the tip on lentils stretching taco meat since I just cooked some up and have lentils sitting in my pantry! Thanks! How about this one? It almost hurts me to do it (I felt like a bad parent at first), but my daughter and I are pretty small eaters. OFTEN, I’ll ask what she feels like for dinner and she’ll say she’s not hungry. So on those days? We eat leftovers or “snack” type foods for dinner. Not only saves energy because there aren’t dishes really, but we listen to our bodies instead of society about when/how we should eat. My tip? Skip a meal if you aren’t hungry! great ideas………Thank you for sharing with the Clever Chicks Blog Hop this week; I hope you’ll join us again! If your shampoo (and/or shower gel) is thick, water it down by about a third. Use warm water and shake it up to mix it. It will still get your hair very clean and you won’t lose globs of it when the thick stuff slides right off your hands! I think we have a lot in common including not replacing all the light bulbs in the bathroom fixture (5 just seems way overkill to me!). I use the baking soda and apple cider method to care for my hair which has saved a lot of money. Some additional things that I enjoy doing to save money are repurposing clothes and making homemade gifts. You spoke of using dry milk. I used to get it all the time for using in baking, hot chocolate mix and even for over oatmeal and stuff but now in our area the dry milk (when you compare the amount it makes) is more expensive then the regular milk. I have been experimenting with just not using milk in lots of baking and it has worked just fine. Powdered milk is more expensive here too. I use to use it for all my baking but its cheaper to use regular milk. (Carnation) and works well-I HAVE to use Carnation as it is lactose free-but either product would work for someone that doesnt have a dairy issue. Thank you for sharing on Wildcrafting Wednesday! Some great suggestions! Thanks for sharing on Tuesday Greens! I’m figuring out the pressure cooker- shorter cooking time means less energy used. Potatoes that would take a half hour on the stove, take less than 10 minutes in the pressure cooker. Instead of using dryer sheets, I use a crumpled up ball of aluminum foil in the dryer…. it fluffs up the clothes and removes the static… This is only when I’m using my dryer.. which isn’t often… I usually use the clothes line. This is a great list. 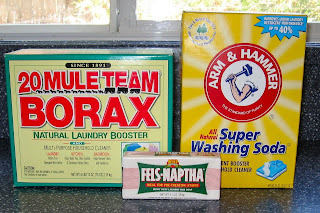 Another great alternative for laundry… use coffee filters as dryer sheets and use Fisherman’s wool as a fabric softners. 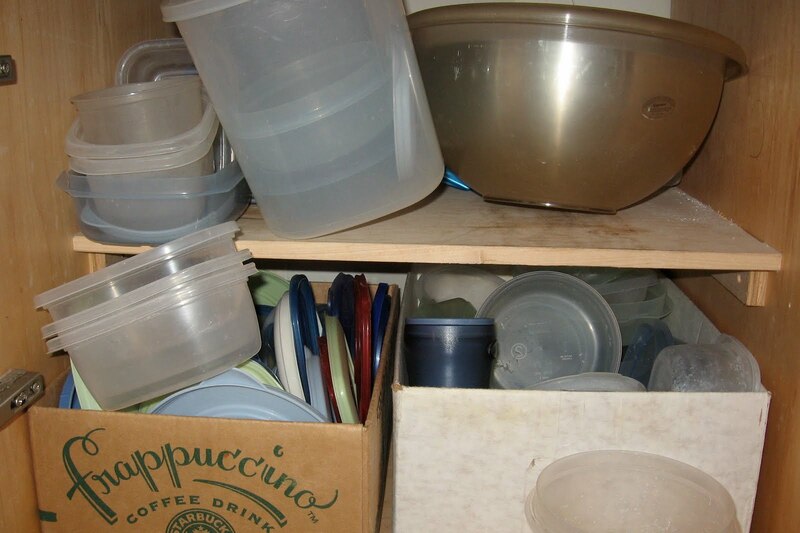 If you are really looking to save money… look into DIY or green cleaning supplies. I have about 10 products and use them for everything! Good luck and thanks for the great ideas. When we run the tap water in the tub to get it hot, we capture the water in a bucket and use it to flush the toilet instead of using the flush valve. Saves a TON of money. We also capture rain water to water plants as well as to flush the toilet. Our water bill went down by 25% in one three month cycle by doing this. Old bread? Cut it into cubes, lightly coat in butter or olive oil, sprinkle some Italian seasoning and toast in the toaster oven. You’ve got instant croutons good for salads or eating as a snack. Two words…I bake. Bread, cakes, cookies, pies. ‘Nuf said. Got potatoes, onions or garlic that’s sprouting? Plant them. 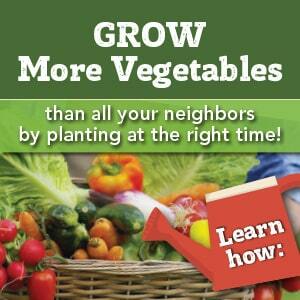 In a few months you’ll be able to harvest your own veggies. We save our water also as we’re waiting for the water to get hot in the tub and in the kitchen sink. I use it in the washer so it’s never wasted. Saves a lot on the water bill. I use old bread in various ways. 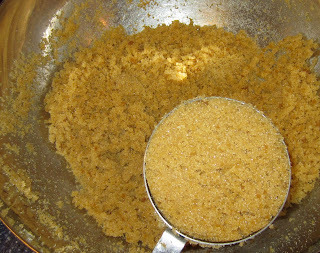 Roughly crumb or chop in small cubes, mix with dried herbs and/or garlic and use as topping for mince mix, chicken and leek mix or pasta bakes. Makes a yummy crunchy topping. Also I freeze cubes or crumbs to use in stuffings for chicken or meat loaves. Cut 1inch from bottom of head of celery and put in an inch of water to grow roots then plant. Use leaves and stalks are flavouring in soup or stews. If we go to a fast food restaurant, I order a solo hamburger and just share my daughter’s child size fries. We can eat out for under ten dollars that way although we only do that a couple times a month. Wool Dryerballs! 6-8 toss the clothes better in your dryer, allowing to dry better/faster and reduce static! Vinegar is a great substitute for fabric softener. Cloth diapers, and training pants are awesome! Instead of cleaning products, vinegar, baking soda, and hydrogen peroxide are great cleaners! Also E-cloth (Norwex is a bigger name, but more $$). Lots of great tips here but I do find it interesting that you recommend cloth toilet paper but not cloth diapers. And if someone wants to do cloth diapers VERY cheaply you can buy maybe six or seven inexpensive PUL diaper covers (one-size adjustable so they last the whole two or three years you need them) and you can use just about anything as diapers inside of them. I have used old men’s tank tops, too-small-for-me t-shirts, wash cloths, dish towels, cotton receiving blankets from thrift stores or garage sales, etc. and just fold them into a long pad shape and lay them in the covers. They wash very quickly and easily and you can hang dry them. You can even hand-wash them if you need to although it does take some elbow grease!!! Three biggest money savers are: putting all electronics on plugs trips and turning off when not in use, hanging laundry outside, and filling up big jugs with water while waiting for water to get hot for dishes and showers and watering plants and/or pouring water into washing machine then doing laundry. I use my water from pasta or vegetables to water my plants with. What about using that water for soups? I buy everything off season including candles, holiday wrap, clothing. For plants, I get all of my plants, indoor and outdoor by growing from seed or cuttings. Seeding your own annual plants and using cuttings for shrubs and perennials saves me hundreds of dollars a year. At the end of the season I buy my ceramic pots for 75 % off. I also will pick out a ceramic pot that has a chip or other flaw and ask for a discount. The big home improvement chains will usually honor your request for a discount on flawed merchandise. I use plants I have grown from seed or cuttings and ceramic pots that I have bought at a discount and give for gifts for housewarming or birthday gifts for 1 or 2 dollars a piece. I can paint over a chip or flaw in a ceramic pot and it doesn’t show at all. I make my own potting soil at a big discount using my homemade compost, dirt from the yard and used coffee grounds plus vermiculite. 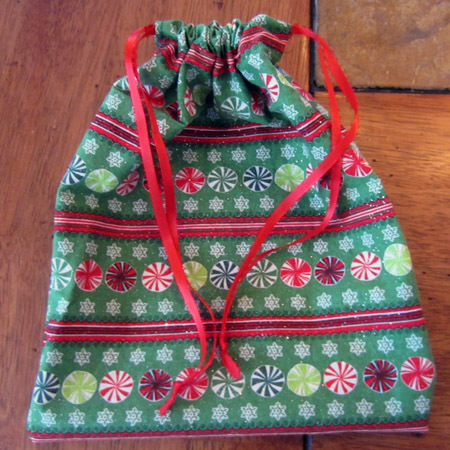 I completely concur with you that we should make gift bags by our own rather than wasting money on buying expensive gift bags. I will be adding a few from your list to my routines. Make popcorn on the stove, way cheaper & healthier than microwave and doesn’t taste like styro-foam peanuts like from an air popper. Also I use less butter (no one can tell) by mixing yellow & white popcorn(3:1). The mind assumes the yellow are loaded with butter. In the shower I don’t use soap everywhere–soaps lasts longer & it helps reduce dry skin. For baked goods that use walnuts or pecans–reduce the nuts by half and add 1 tsp of black walnut extract. Another–doesn’t save much money but helps the environment. I buy toilet paper by the case and it is wrapped in plastic; I open it carefully & use it as a trash bag to line the bathroom can. I like it because it is one less time I have to wash the can. Buy all the same socks–they are easier to match and if one goes AWOL you can find a mate close by. I like to use 1/2 cup of white vinegar in my laundry wash cycle as a fabric softner and germ killer. Very inexpensive and very soft laundry – even when I hang it up to dry. I also like to grow my plants from cuttings, or I buy the smallest possible size plants from the nursery and watch them grow in my house. Plants can be exchanged with friends instead of buying. I also use “lemon vinegar” for most of my cleaning tasks around the home. I save the peel form lemons, tangerines and grapefruits in the freezer, and then stuff them in a glass jar as many as possible and poor ordinary white vinegar to fill the space. Put the screw top, put the jar in a dark place for 2 weeks, then filter the vinegar, dilute with equal amount of water, put in a spray bottle, and it’s ready to use! Good stuff my Grandma taught me but I forgot! I love all of your suggestions but one of them is completely wrong: a toaster oven is one of the least efficient appliances out there. You actually use less energy (gas or electric) using the oven. The only real “energy” benefit is when it is super hot and you don’t want to add more heat to your home. Just FYI, otherwise a great list! I love this list because it requires us to begin thinking about how we can be better stewards of our resources, rather than mindlessly using all that we are given. There needs to be a real intent as to how we’re utilizing the gifts and blessings we’re given. Far too many go without for us to be so cavalier all the time.